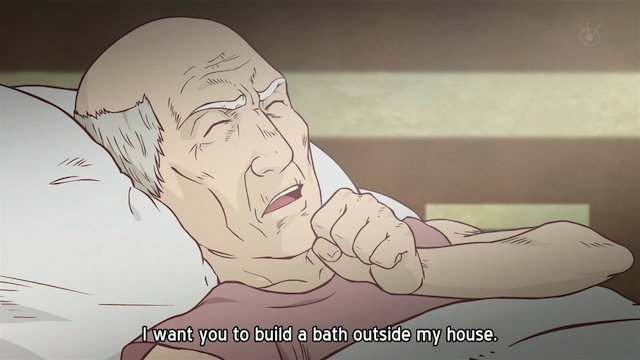 Thermae Romae 1-3 ~ Take a bath. Relax. I’m sure something will come to mind. The glory of ancient Rome is only part of the story. 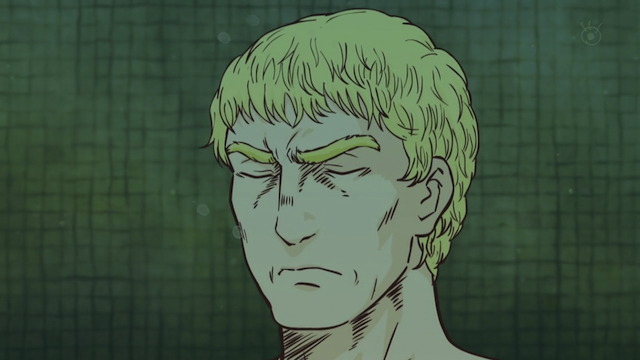 Thermae Romae is already half over. This review is based on viewing the first three episodes. Behold the story of Lucius, a Roman architect, who finds inspiration in the most unusual of ways: via a hot tub time machine. This short series is entertaining in a low-key way. For the most part the humor is found in looking at ordinary Japanese customs from the perspective of a stranger. Before I go any further, I wanted to hook you up with the ED, which is performed by Chatmonchy. It is a fun song, so feel free to play it while you read about the series. The architect Lucius Modestus tries to relax in a public bath. The main character is an arrogant Roman architect. His ideas for public bath houses (thermae) are rejected, however, because his thinking is too traditional. The show essentially follows him as he relaxes in a bath and gets inspired by a journey he takes to an advanced civilization populated by a “flat-faced” tribe. Lucius himself is barely likable in that he starts by believing that Rome is the most advanced civilization possible. He does, however, come to appreciate the “genius” of the Japanese, in the advances they have made in bathing culture. 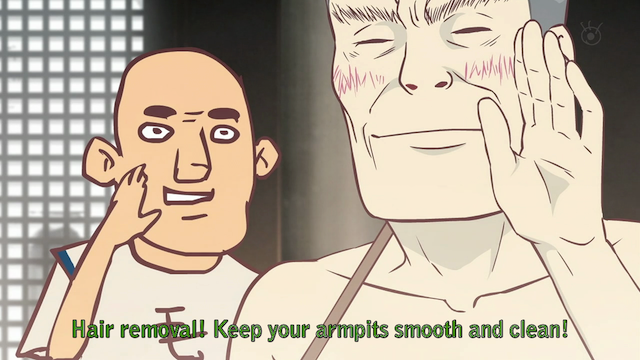 It is important to note that this is a Flash-based animation. In fact, I feel like saying “animation” because the images jerk about, but no effort is made towards making the movement smooth or natural. The artwork, on the other hand, is a curious mixture of interesting and horrible. Most of the characters are older men, and a surprising variety of character designs is present. The main characters in an episode are generally handled nicely, but some background characters are bizarre or poorly drawn or both. I don’t understand the inconsistency in styles at all. This is the weakest aspect of the show. In-joke. 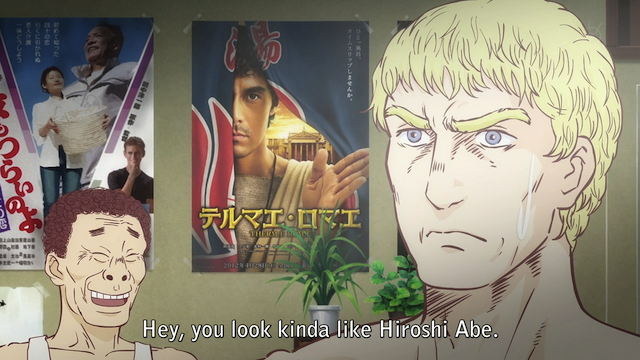 Hiroshi Abe is seen in the poster use behind them ... the poster for the movie version of Thermae Romae. One thing I wondered when I picked this as one of the more intriguing titles of the Winter 2012 anime season was whether the anime would really turn out to be just a commercial for the live action movie. A bit of a flag was raised when the movie poster appeared in episode one, but I think it stands on its own. Although the production values could have been much better (if they hadn’t gone the Flash route), it does have a certain charm. I certainly will continue watching to see more of the strange observations on bathing culture. You can't beat fruit milk after a hot bath. As I said, the humor in the series comes from looking at everyday things (for a Japanese audience, at least), but from a stranger’s perspective. Simple things, like fruited milk, become revelations to our ancient Roman perspective character. Novelties that he is eager to bring back to his own time and place. A good example of a character design that you wouldn't normally see in an anime. If these characters were brought to life on a reasonable budget, this show would have been more interesting. If you look over all of the screen shots of Lucius, you will notice that he almost always looks EXACTLY the same. This is a perfect example of how lazy the animation studio is. The main character was seen as a vehicle for reducing costs by re-using the same graphic over and over and over again. So should you watch it? The first thing to consider is that this is actually the running length of a short OVA — I believe there are only 6 episodes that will be broadcast, and two more to be included as specials on the discs. It is not the most hilarious show I have ever seen, but it is amusing. It certainly is unique. It had the potential to be much more, which might be a bit of an unfair critique, since the judgement should be on what it is, not what I feel it should be. I’m happy enough having watched it, but I would not spend money on a disc set. I am interested in checking out the live-action movie to see if the material is handled better. It certainly isn’t a “Must” watch, but I don’t see any reason to “Avoid” it either. I think you’re mistaken. 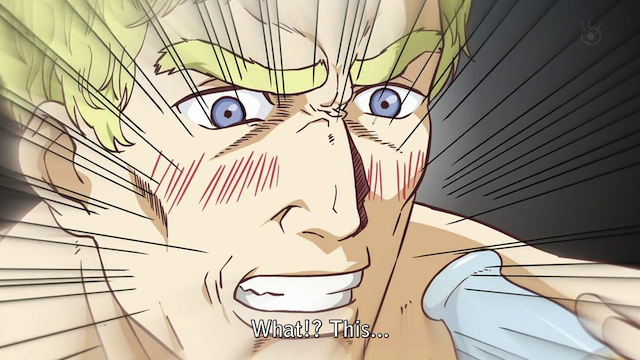 Ep3 isn’t the final episode of Thermae Romae, there are actually going to be 6 in total. It’s just that the show is being aired in three slots (two eps at a time). I definitely recommend watching ep4, it’s my favourite so far. Thanks, I corrected the article. Double-J was another show I felt the same way about. It was a pretty good concept, but the decision to go with Flash animation kept it from achieving its potential. I’m sure you are right that this is much cheaper than doing a decent job, but I do not find myself comforted. 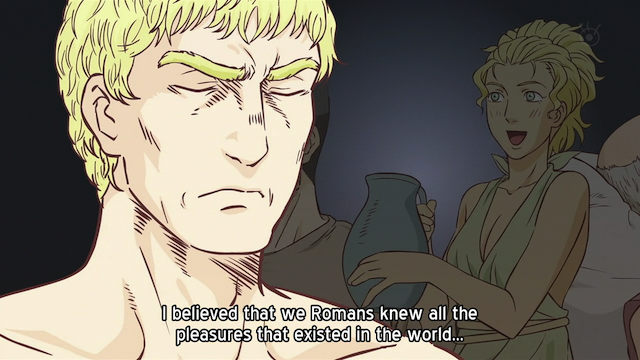 In my head I am comparing Thermae Romae to House of Five Leaves, which had a wonderful sense of place. 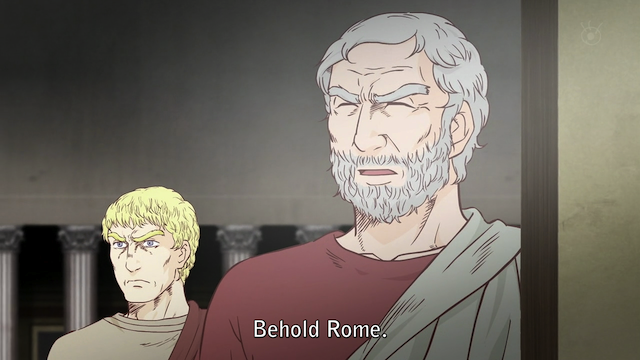 I know Thermae Romae was going for humor, and Five Leaves was a drama, but that careful attention to setting was what really made House of Five Leaves come alive for me, and I think something like that could have been done here as well (not on this budget, but that was someone’s creative decision). This show is hilarious! I like this show. It’s unusual animation, since it’s based on flash, and drawing is not typical anime. I didn’t know I am a flat faced. That public bath with a lot of old people, just reminds me of my hometown and I was laughing really hard. And the washlet (Japanese bidet) skit was so funny. It is pretty funny. I like the fact that he shows up in very random places: Instead of appearing at the ultimate bath house, he first appears in a very average bath house. I wonder if the live-action show will turn out well.